*Price is for 8 packs of 200 grams each - 3.5 lbs. 10.6 lbs (8 pack x 3) - $20.99. Our Color Powder collection is available in Beautiful, Vibrant Colors like: Red, Light Blue, Yellow, Green, Pista Green, Orange, Gulal, Royal Blue & Pink. 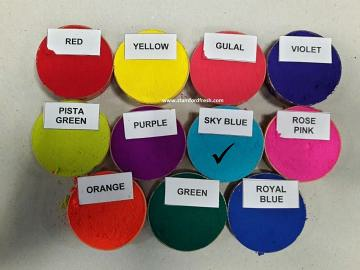 2) These colors are not for painting or dyeing purpose. 3) Make sure that your face is well creamed before and after the play. 4) Please ensure that your eyes remain protected at all times. Use sunglasses to protect your eyes. 5) If you are prone to skin allergies, avoid playing with colors altogether. This item in Holi Festival category was first added to our catalog on 04-16-2017. Buy Holi Color Powder Sky Blue 3.5lbs (8*200gm), sold & shipped by Desi Wholesale where you can shop online for Quality Indian Groceries, Spices, Dals & Snacks @ Lowest Price. This Holi Colors collection has been tagged as color starch, color run chalk powder, holi festival powder, rangoli color, Holi Color, color run, events photo shoots, parties, holi, festival, marathon, schools, bhakti, colour run, rang, rangoli color.